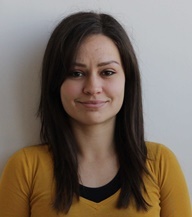 Beáta Borza graduated with bachelor's degree in Biochemical Engineering from University of Pannonia in 2014 and she finished her master course in Chemical Eningeering specialized in Biotechnology at the same institution two years later, in 2016. Both degree thesis’ were written in Research Institute on Bioengineering, Membrane Technology and Energetics. She investigated the production of biohydrogen and microbial electrohydrogenesis cells. At the moment she is a Ph.D. student at Horváth Csaba Memorial Institute for Bioanalytical Research. Her current research focuses on circulating tumor cell capture and analysis with microfluidic devices.